In counterexample-guided abstraction refinement, a predicate refinement scheme is said to be complete for a given theory if it is guaranteed to eventually find predicates sufficient to prove the given property, when such exist. However, existing complete methods require deciding if a proof of the counterexample’s spuriousness exists in some finite language of predicates. Such an exact finite-language-restricted predicate search is quite hard for many theories used in practice and incurs a heavy overhead. 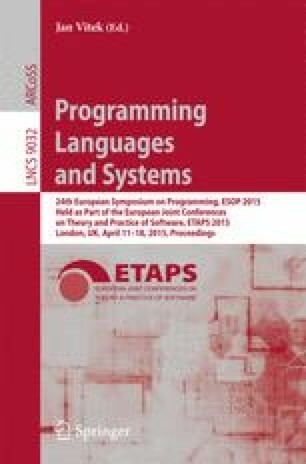 In this paper, we address the issue by showing that the language restriction can be relaxed so that the refinement process is restricted to infer proofs from some finite language L base ∪ L ext but is only required to return a proof when the counterexample’s spuriousness can be proved in L base . Then, we show how a proof-based refinement algorithm can be made to satisfy the relaxed requirement and be complete by restricting only the theory-level reasoning in SMT to emit L base -restricted partial interpolants (while such an approach has been proposed previously, we show for the first time that it can be done for languages that are not closed under conjunctions and disjunctions). We also present a technique that uses a property of counterexample patterns to further improve the efficiency of the refinement algorithm while still satisfying the requirement. We have experimented with a prototype implementation of the new refinement algorithm, and show that it is able to achieve complete refinement with only a small overhead. This work was supported by MEXT Kakenhi 23220001, 26330082, 25280023, and 25730035.